Featured in the ‘New Cars & Reviews‘ section the two page article, written buy Fifth Gear’s Jonny Smith, gives the history of Eleanor, from the original movie in 1973 starring a Mach1 Mustang to the modern remake in 2000 and the legal battles with Shelby are also mentioned. However the article is great wrap for Classic Recreations who seem to be the feature company of the article. The article outlines what Classic recreations are doing with their builds and the article turns quickly into a review. Clive Sutton is the exclusive dealer of Classic Recreation Eleanors in the UK, which I posted about a few months ago. The film was a remake of the 1974 original, which centred on a gang of car thieves who had to steal to order 48 vehicles within a matter of days. For secrecy, each car was referred to by a woman’s name. In the central half-hour chase sequence no fewer than 93 cars were wrecked. In this version, Eleanor was a 1973 Mach 1 Mustang. A man called HB “Toby” Halicki produced, directed, starred in and did the stuntwork in the original. So dedicated was he, he compacted 10 vertebrae performing the film’s 128ft long-jump finale. Halicki never walked the same again and later was killed in a freak accident when a prop water tower collapsed and a steel cable lashed him. The car-theft classic lurked in the shadows of Steve McQueen’s Bullitt ¬until Halicki’s widow gave the green light to a Disney remake, starring Cage and Jolie. 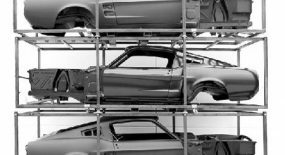 Its commercial success spurred several companies to produce replicas of the Eleanor Mustang — but without the consent of Denice Halicki, who owned the copyright and trademark rights to “Gone in 60 Seconds” and “Eleanor”. 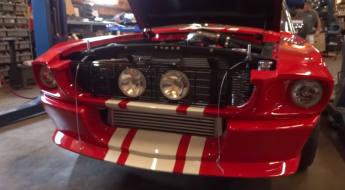 She took legal action and last year won a battle against the racing hero Carroll Shelby, who had been selling replicas as “continuation models” of his original Shelby cars. Today, the only official licensed Eleanor maker is Classic Recreations — a crew of ZZ Top lookalikes in Oklahoma, USA. This Eleanor is the kind of car your mother wouldn’t like. I find it lurking in leafy St John’s Wood, London, a sinister vision of throbbing metal that bulges with menace and muscle. It’s a villain’s car. In fact, some of the most dastardly villains in Hollywood have outrun the long arm of the law in the very same car. And now it’s my turn. You’d have to be a pretty dedicated enthusiast to buy a car that costs £130,000, but so few Eleanors are built that you can bet it will hold its value better than most glitzy sports cars. This machine may have enough power under the hood to destroy a set of tyres in a single traffic-light burn-out but it is constructed at a snail’s pace. Classic Recreations takes three months to build each one. 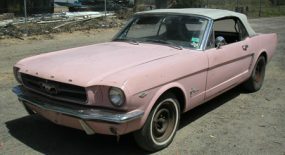 An original 1967 Ford Mustang is transformed into better than new by the addition of modern mechanicals. 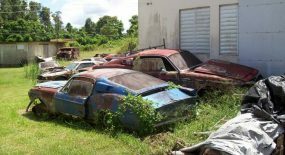 Depending on the ¬donor car’s condition, it is either completely taken apart (including the roof) to have all the panels replaced with high-grade steel, or reshelled with a brand-new Ford-licensed body. In both cases the car retains its 1967 identity, thus making it tax-exempt once delivered to English soil. Joy. The moment I set eyes on it, my mind is awash with visions of Nic Cage’s bridge jump, a stunt that made the Dukes of Hazzard’s leaps look like supermarket speed-hump incidents. The refreshing thing is that even though this is a bona fide classic, it doesn’t call for endless weekends of tinkering in a damp garage or trawling auto jumbles in Newark. The driving experience, however, does call for a certain amount of, er, commitment. Pull out the racing-style quick-¬release pins from the bulging codpiece of a bonnet and there beats one seriously agitated V8 trying to punch its way out. The Eleanor’s DNA may be 1960s Detroit, but it boasts a highly tuned, hand-¬assembled 6.7-litre V8 fed by fuel injection. It generates 535bhp and delivers 525lbft via a manual transmission to the rear wheels, with no acronyms to speak of. Forget about ABS, DSC, TC or ESP to save your skin. This is an experience that demands input and rewards with an analogue driving experience. A full-on racing harness clamps me behind the wood-rimmed wheel of a machine whose namesake — at least at my secondary school — was 3ft tall and looked like an owl wearing NHS horn-rimmed spectacles. Eleanor never conjured up sheer lust — until now. Beneath the classic lanky gearshifter is a decisive modern five-speed transmission that doesn’t require Popeye’s forearms to select a gear. The rack and pinion steering provides feedback — something few drivers of an original Mustang have ever experienced. And you don’t have to plot an escape route if the car in front of you hits the anchors because cross-drilled ventilated disc brakes quickly scrub off speed. There is even fully adjustable coilover suspension in each corner for when the roads are anything less than dragstrip-smooth. Don’t think it’s too refined, however. We are still talking boxing, not knitting. It’s just that the boxing is with gloves rather than in the style of a bareknuckle death match. Granted, London isn’t the best place to dig the spurs in and make this pony gallop. Pressing the throttle beyond halfway would probably cost me my licence. And as for the “Go, baby, go” nitrous oxide button atop the long gearlever, er, not today. There’s a 180mph speedo, and Eleanor will achieve it with ease if you have a Prince Naseem Hamed moment. 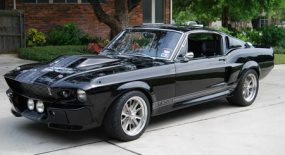 For the same money you could own a genuine 1967 Shelby GT500 Mustang. It’s a rare and beautiful thing but couldn’t hold a candle to this Eleanor, even if that weren’t missing the point. The period black-vinyl-and-chrome-embellished interior disguises sprinklings of modern tech such as air-conditioning. And I’m not sitting in standstill traffic watching the temperature gauge like a hawk: it isn’t budging because Eleanor’s got a state-of-the-art aluminium radiator with electric cooling fan. There is a constant reminder that this is endorsed by Denice Halicki because her autograph is penned across the dash. The “Gone in 60 Seconds” emblem appears everywhere I look, trademark logos and all. I’m fighting the temptation to set the chubby 9½in rear treads blazing, but Eleanor is tight. She’s done only 800 miles and, like all hand-built masterpieces, she needs everything to bed in before true punishment can take place. They always drive better with a few thousand miles under their belts. Plus, the car I’m in is currently the sole Eleanor in Europe so putting it backwards through the gates of Lord’s cricket ground won’t win me any friends. To be honest, Eleanor reminds me of Madonna: middle-aged but with no visible signs of ageing and easily capable of 50 index-finger press-ups followed by a 25-mile run — HRT meets bhp. You may still be wondering who on earth this car is aimed at. Ask the Aston DB9 driver who has just passed me very slowly to rubberneck. His £120,000 car is 12 months old and, in the current climate, worth £60,000 or so. The classic market, though, is holding firm. People are realising their cash is safer in vintage steel than under the mattress. And a car such as Eleanor is an investment that will reward you the moment you open the garage door. Jonny Smith co-presents Fifth Gear, on Five. i got one in 2005 was the 1st one in UK and still is the only supercharged one! viewed at the NEC exibition center 3yrs running. 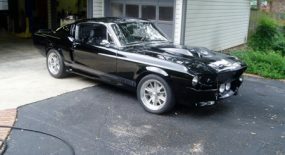 Looking for 1967 Ford Shelby Mustang GT500 Eleanor addition, “project” car. Message me if you have this car or know where I can get one. Thanks… any response is greatly appreciated. Love This Car. Want One!